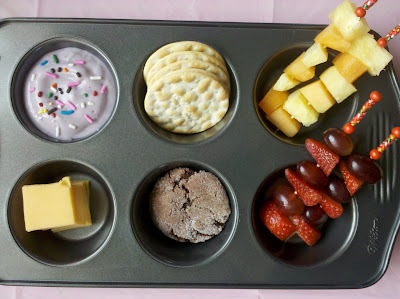 Muffin Tin Meals make fantastic and creative after school snacks. Even if your kids are in school all day, they can still come home to a little treat every now and then. Prep ahead of time and throw it together last minute. I tried to sneak a few bites of this and my sweet daughter would have none of it. inhaled the whole thing in a matter of minutes. We love anything in kabob form, this snack looks fantastic! I love the kebabs. What a great idea!